My name is Kaitlyn Srey, and I am an Intern with the City of Asheville Youth Leadership Academy working with the Asheville Area Chamber of Commerce this Summer. I’m a rising senior at Clyde A. Erwin High School. My goal is to graduate college and walk through any doors that open into the hospitality industry. When I was told I would be working at the Chamber of Commerce, I didn’t know what to expect. So, I prepared myself for the mountain high stacks of paperwork. My first week at the Chamber, I worked with the membership department. During this week, membership had an event called WomanUp. My week consisted of researching, preparation, networking and, some paperwork. While working with finance in the second week of the internship, I did get a few papercuts. Finance is what keeps this place spinning. At the halfway mark, I’m with the economic department. While working with this department I’ve done a ton of research and have been to a few meetings on new plans and relocations. I will be working with the visitors bureau later this summer and get another new learning experience. 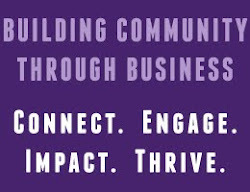 The Chamber's mission statement is, “Building Community Through Business.” Building community through business is something Asheville brings to the table unlike any other city. With our rapid population growth of millennials in our area, businesses should consider relocating or expanding to Asheville. Something I learned with economic development is that there are so many factors that are taken into consideration when they are relocating or expanding their company. Working with economic development has been the most educational so far. The combination between big businesses and local businesses that employ a great number of the Asheville metro is what makes our community. Heidi, the one behind all of the research, really fascinated me when I discovered that every one hundred people employed creates two hundred and twenty two more jobs. Clark described this as a ripple effect. The Chamber works hard to keep the workforce balanced between industries, because if we didn’t, it could have a toll on our society. While working at the Chamber, it has made me realize what a great city Asheville is. My vision is to own a hotel and place it right here in Asheville. This internship has taught me to make eye contact, dress appropriately, stay engaged to conversations, and that work isn’t always gonna be fun. Now that I’ve got a taste of working at the Chamber, I’m happy to say I wouldn’t want to have worked anywhere else. The City of Asheville Youth Leadership Academy (CAYLA) is committed to providing its students with a) a meaningful summer work experience, b) leadership development through seminars and community service, and c) college preparatory activities, including yearlong academic support. Since its inception in 2007, CAYLA has been nationally-recognized by the U.S. Conference of Mayors and the Harvard Kennedy School of Government. In 2011, CAYLA was honored with the North Carolina Governor's Award for Volunteer Service.